The idea of bringing a free-to-play mobile game to the Playstation Vita is a risky one. Mobile ports have been done in the past with disastrous results — Dungeon Hunter Alliance and Asphalt Injection, to name a couple, were marked up considerably higher than their smartphone counterparts despite not bringing anything new to the table. Thankfully, that is not the case with Table Top Racing, the latest release from Ripstone. The Vita release is dubbed the “ultimate version” of the game, and it lives up to this label. 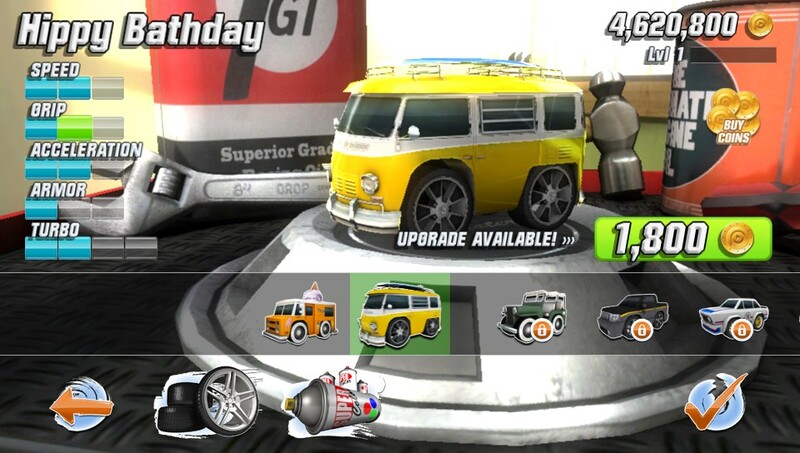 There are numerous improvements over the Android/iOS version, most noticeably the addition of an acceleration button, better graphics and the ability to play the game online or via an ad-hoc connection. If you have played the mobile version of the game, you will have a very hard time going back to it after giving it a spin on the Vita. The gameplay is essentially a hybrid of Micro Machines and Mario Kart. The vehicles are all miniature in size (think Hot Wheels), and races take place on the tops of various counters and tables. 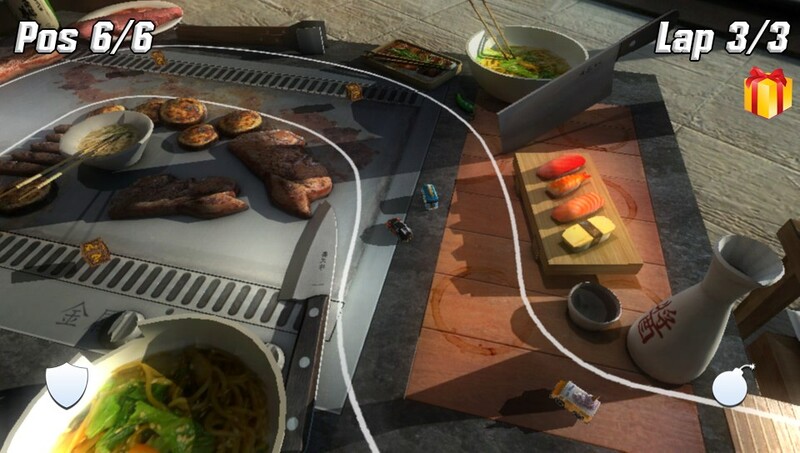 Every track has its own unique theme, ranging from sushi restaurants to workbenches to picnic tables. These courses are throwbacks to the classic Micro Machines games, and there’s even an option to change the camera view to a top-down perspective just like the old NES titles. By default, the game uses the behind-the-car camera found in most cart racing titles. Standard races have powerups scattered throughout, giving you the ability to use a speed boost or to attack opponents with homing missiles, bombs or EMP blasts. In general, races are short — the average being just 1-3 minutes each — but they are also full of action. For $7.99, there is a surprising amount of content. The game’s main mode, Championship, has you play through a series of cups, all of which have multiple types of racing objectives. Some are standard fare, such as time trials and traditional races with or without powerups, but others, like Pursuit and Elimination, are unique. In Pursuit, your only goal is to catch up to a single car ahead of you and run into them before running out of time. In Elimination, whoever is in last place at the end of each lap gets knocked out of the race. By having such a diverse set of races, the game manages to remain fresh throughout its sizable campaign. There are also modes specifically for drifting and for a set of “special events” that can only be unlocked as you level up your profile. The leveling-up aspect is where microtransactions come into play. Every race gives you the opportunity to earn coins — finishing first gives you the most, naturally — that are used to buy new vehicles or upgrade the ones you already have. You can also change the paint style and get all new wheels that provide certain advantages (i.e. one set will give you a shield every lap, another will give you more coins per race). Basically, the microtransactions are in place if you want to skip the grind of leveling up. There is a bit of a slow start because of this, but it’s not unbearable. I never felt the need to buy more coins, as the championship mode in particular provides them at a steady clip. 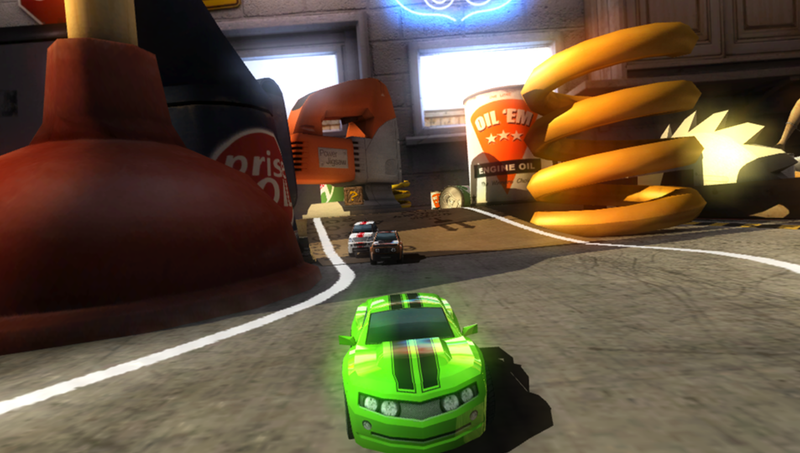 In general, Table Top Racing succeeds at what it sets out to do, that being to provide a well-refined arcade racing game. However, there isn’t much to make it stand out from the rest of the pack. The tracks, while aesthetically pleasing, could really benefit from more interactivity. There aren’t any crazy jumps or moving obstacles — every course follows the same basic template. And while there are plenty of vehicles to choose from — everything from ice cream trucks to sports cars — the game could use more diversity in its weapons. Having access to just four different types of powerups feels a little too restrictive. Still, even if the game is a bit simple-minded, there is certainly enough content to give you bang for your buck. The price is more than fair for what the game provides, and it makes for a nice diversion from other, more complex games. If anything, Table Top Racing is a great example of a mobile port done right.